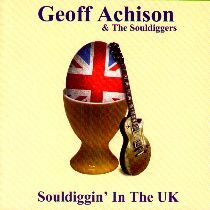 The reputation of Antipodean Geoff Achison continues to grow, and will be further enhanced by his latest (live) album. "Souldiggin' In The UK" showcases both sides of the man's talents as a guitarist: the first five tracks are solo acoustic performances, whilst the last six are electric band recordings. For the latter he is joined by the ace rhythm section of Sam Kelly (drums) and Dave Clark (bass), who together with Dave Lennox (keyboards) made up the Souldiggers for Achison's latest tour. It all starts with the tale of lost love that is "He's Got A Way With Women," before moving on to the only original track here ("Begging Bowl") which hints at his talents as a songwriter. Achison's acoustic guitar playing is firmly rooted in the blues, but contains elements that seem to derive from flamenco as much as anything else. He uses this to great effect on the first half of the album to inject passages of extra intensity and passion into the songs. Add in Achison's soulful vocals, and you get some idea of how he can take on songs like the Neville Brother's "Voodoo"--the pick of the acoustic tracks--and Greg Allman's "Whipping Post" and make them work as acoustic songs. When he is joined by the Souldiggers for the electric tracks things get a bit more funky. On the first of these (Mel London's "Sugar Sweet") Lennox's keyboards impart a distinct Neville Brothers feel to the band's sound, which carries over to some of the other tracks too. Although all of the tracks are covers, they are arranged by Achison in such as way as to make them sound fresh and original, whilst still remaining true to the original song. His interpretation of "The Same Thing," for example, is reminiscent of Jimi Hendrix at his bluesiest. The pick of the electric tracks is the excellent closing version of Champion Jack Dupree's "24 Hours," which includes some musical jousting between Achison and Lennox. On this one Achison shows that he is more than capable of cutting it like SRV anytime he wants to. "Souldiggin' In The UK" has to be one of the best live albums released this year. Geoff Achison is undoubtedly a class act: a singer/guitarist who is equally at home playing solo, or with a band, and who has his own identifiable sound. If you have trouble finding this one, try the Bottleneck Blues Club web site (www.bottleneckblues.co.uk), or Geoff Achison's own site (www.souldigger.com.au).